There are some homemade goodies that I can eat right out of the jar one my neighbor’s sauerkraut and the other the Ruth Reichl’s pickled red onions, I know strange but true and I do not apologize, but last night was a nice fall night to toss something on the grill and what could be better than a snappy good bratwurst nestled into a toasted bun on a bed of kraut and pickled onions…sadly I didn’t have the neighbor’s sauerkraut, but good store-bought name brand worked just fine with a little pampering. My mandatory first step is to simmer the brats in beer for about 5 minutes or so, plate them until the grill is heating up saving the beer in the pot to warm the rinsed and drained sauerkraut. Next, take the amount of sauerkraut that you need, pour it into a mesh strainer and gently rinse. Drain for a few minutes. 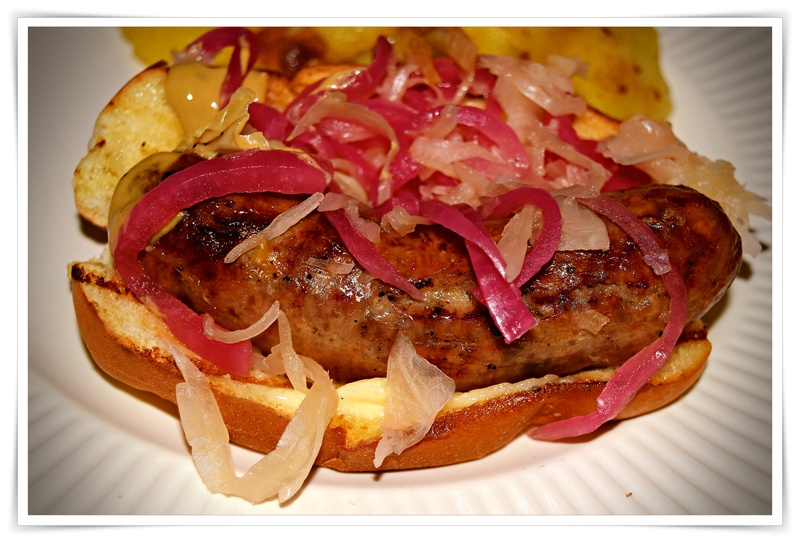 Simmer the beer for a few minutes then add the sauerkraut and thoroughly heat, drain again place the kraut in a bowl, and add some of the pickled red onions…now they are ready your cooked brats and toasted buns. 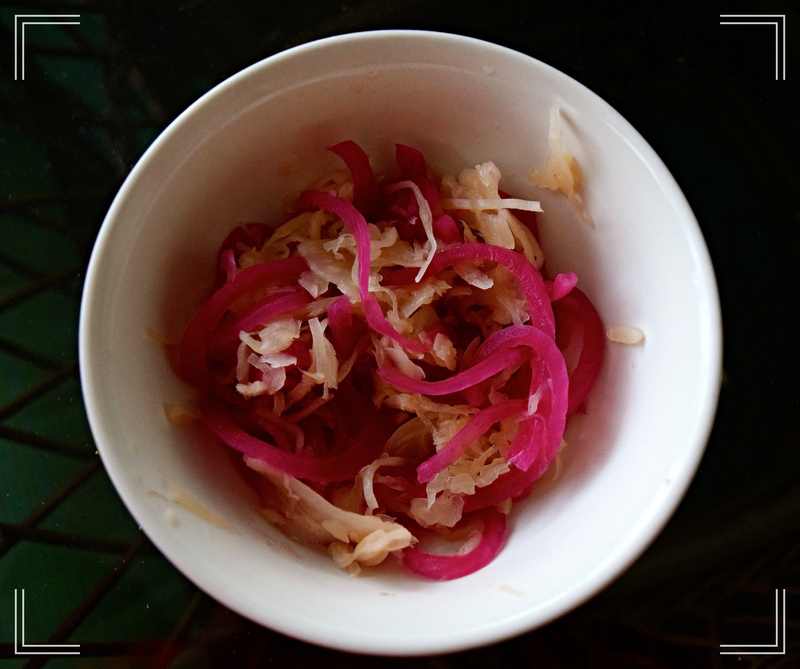 Consider canning a small batch of pickled red onions to keep on hand in the pantry. There are many canning processing links to choose from for pickled red onions and you don’t have to make a huge batch unless your husband brought home that giant bag of onions from Sam’s Club! Staples: 6 tablespoons vinegar, 1/4 cup sugar, 2 teaspoons salt, 4 cups water. Slice the onions into fairly thin rings. Put 4 cups of water into a small pot and stir in the vinegar, sugar, and salt, and bring the liquid to a boil. Add the onions and simmer for 2 minutes. Drain. These will keep for a week or so in the refrigerator.